Sony Classical and Madison Gate Recordsproudly announce the release of "FENCES" (Original Motion Picture Soundtrack), featuring music by Marcelos Zarvos. The soundtrack will be available December 16. The film arrives in theatres on December 25. "Fences" is the story of Troy Maxson, a mid-century Pittsburgh sanitation worker who once dreamed of a baseball career, but was too old when the major leagues began admitting black players. He tries to be a good husband and father, but his lost dream of glory eats at him, and causes him to make a decision that threatens to tear his family apart. "Fences" is directed by Denzel Washington from a screenplay by August Wilson, adapted from Wilson's Pulitzer Prize-winning play. The film stars Denzel Washington, Viola Davis, Jovan Adepo, Stephen McKinley Henderson, Russell Hornsby, Mykelti Williamson, and Saniyya Sidney. The film is produced by Scott Rudin, Denzel Washington and Todd Black. 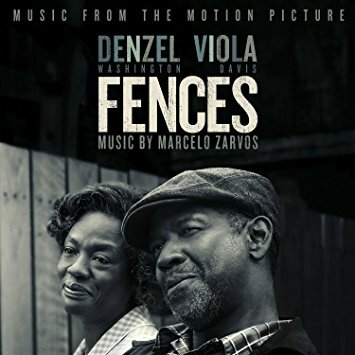 Of the score, composer Marcelos Zarvos said, "In Fences, my goal was to create a score that enhanced the film's moving and powerful performances while navigating the wonderful dialogue of August Wilson's timeless and universal script. The score featured the piano as its main melodic voice in addition to a full orchestra of strings, winds, a solo trumpet and harp. Denzel Washington's deep command of the material as both director and actor informed the composition process every step of the way. As Denzel Washington pointed out several times, our first and most important challenge was to imagine and carve out the right space for our score since there wasn't any in the original play. In his own words we all had to be as good as August Wilson, music included. I found that high register elements such as soft violins and violas worked best under both Denzel Washington and Viola Davis' rich dialogue. Another great source of inspiration was the character of Gabriel who acts as the motivator for the very first (Gabe Walks Away) and last of the score cues (Gabriel's Trumpet/ Ending). I believe the spiritual connotation of Gabriel's name and the fact that he played the trumpet was a clue from August Wilson as to both the metaphysical nature of Gabriel's character and also of music itself." Facebook (facebook.com/FencesMovie/) or Twitter (@FencesMovie).